Marines and sailors with Special Purpose Marine Air-Ground Task Force – Southern Command at Soto Cano Air Base, Honduras, welcomed a third partner nation military liaison officer to the unit’s command staff during their deployment to Latin America, Sept. 26. The addition of Honduran Naval Infantry Lt. Milton Roldan Meza Sanchez to SPMAGTF-SC’s staff is both paramount to the success of its mission, as well as a step forward to assembling a multinational maritime task force – service members, equipment, and aircraft aboard naval vessels from multiple nations coming together to respond to natural disasters and humanitarian crises that can impact the region. “I’m excited to use this opportunity to learn as much from the U.S. Marines to bring back and teach to my marines in Puerto Castilla, Honduras,” said Meza. Meza comes from a background of distinguished leadership. Prior to his appointment as SPMAGTF-SC’s Honduran liaison, Meza served as the commander of the First Special Naval Forces Battalion. This experience reinforces his role in SPMAGTF-SC. As a liaison, he serves as a conduit of communication between the two nations and coordinates and supports all activity as SPMAGTF-SC seeks to build cohesion in the region through shoulder-to-shoulder training with its partner nations. Meza pointed to the Honduran Naval Infantry’s evolution into more amphibious operations, its growing uniqueness from the Honduran Army, and the reduction of training and operational incidents among the branch comes as a direct result of cooperation with past iterations of SPMAGTF-SC. Combining his duties as the liaison and SPMAGTF-SC’s assistant operations officer, Meza will work closely with U.S. Marine Lt. Col. Juan Svenningsen, SPMAGTF-SC’s operations officer, to participate in the planning process and develop future training events between the forces. 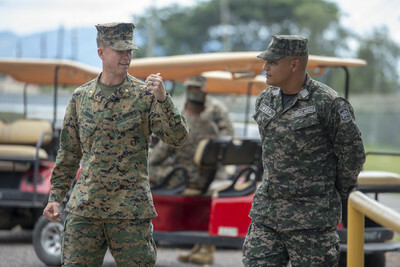 Immediately after being hand-selected for the position, Meza began utilizing his abilities by participating in a three-day training exercise with SPMAGTF-SC’s crisis action team during a subject matter expert exchange between the Honduran Air Force, Honduran Navy and the U.S. Marines in La Ceiba, Honduras. As part of the exchange, the participants used the Marine Corps planning process as they were tasked with responding to a notional hurricane from a remote command operations center. SPMAGTF-SC, now improved with another liaison officer from its host nation, stands ready to respond at a moment’s notice to any humanitarian crises and natural disasters in its area of operations.